Left: Upper Poleta Formation "buff-blue-buff" limestone is 40 m thick here in the Poleta folds area, 25 km from Papoose Flat pluton. The thickness of the section here is reasonably typical of its regional thickness. 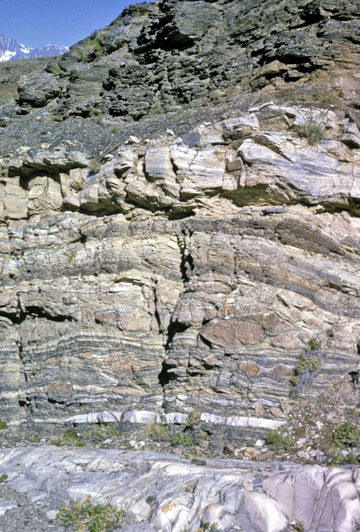 It is overlain by the Harkless Formation. ©A.G. Sylvester 1966. 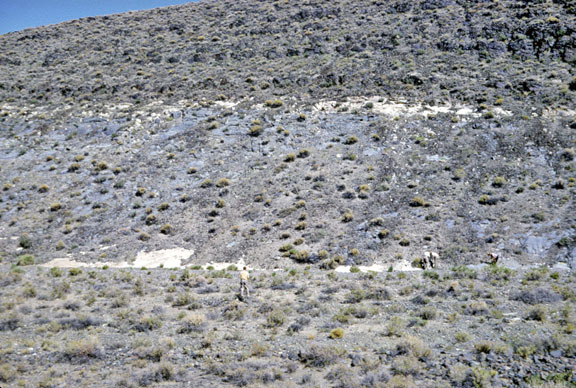 Right: Upper Poleta Formation "buff-blue-buff" marble is 2 m thick near the west end of Papoose Flat pluton. 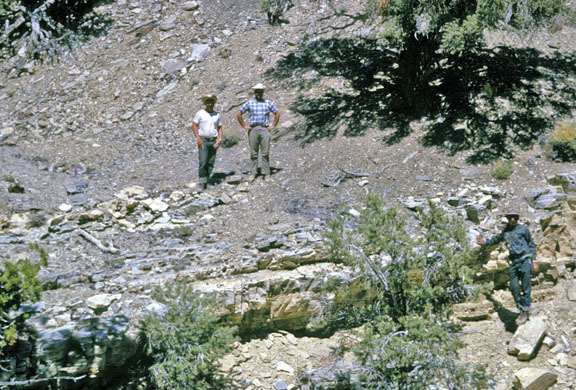 The geologist on the right stands at the base of the "lower buff"; the two geologists stand on the "upper buff". The intervening blue marble is 1 m thick. ©A.G. Sylvester 1963. Left: Attenuated middle and upper Poleta Formation in contact with granite near the west end of Papoose Flat pluton. 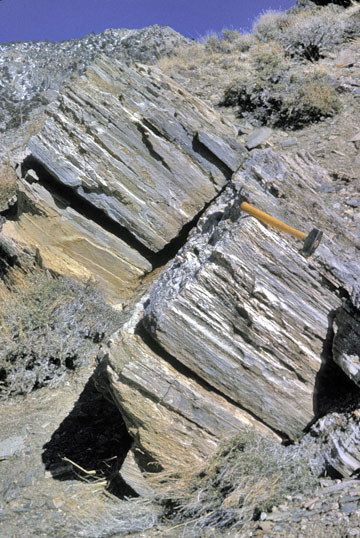 Upper Poleta marble, a 2 m-thick buff-blue-buff of marble, is overlain by Harkless schist (dark gray). Light gray granite underlies boudinaged middle Poleta schist and tan marble. Note 20 cm-thick, white granite sill about 1 m above the granite. Hammer right of middle center for scale. © A.G. Sylvester 1965. Right: Upper Poleta "buff-blue-buff" marble is only about 1 m-thick near west end of Papoose Flat pluton where it dips gently southward. Hammer handle is 38 cm long. ©A.G. Sylvester 1963. 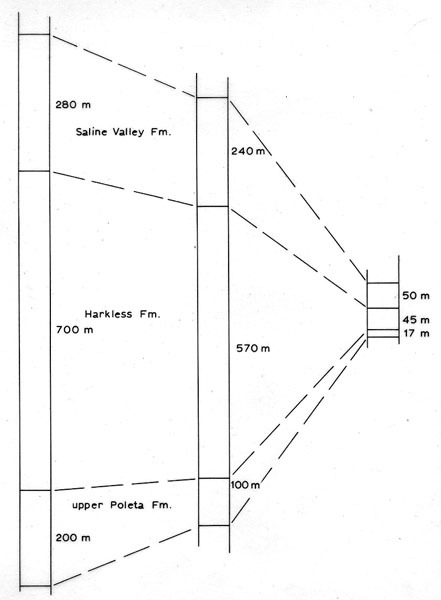 Diagrammatic representation of the attenuation of upper Poleta, Harkless, and Saline Valley formations. Formation thicknesses on the left side of the diagram are typical of their regional thicknesses; those in the center of the diagram are typical about 3 km north of the pluton; those on the right are typical attenuation thicknesses around the west end of Papoose Flat pluton as pictured above.